2016-17 Flawless BK Player Case FILLER #9 ALL PLAYERS IN!!! Top 2 receive 5 Player Each ! 8 spots receive a spot in the free end of the month case random. Each Box contains One Encased Autograph, One Encased Base or Base Parallel, Six other Autographs, One Memorabilia Card, and One Autograph/Memorabilia/Diamond Card! The top-end basketball program of the year gets another upgrade! Every jewel card in Flawless is now a single, double, triple or jumbo diamond! 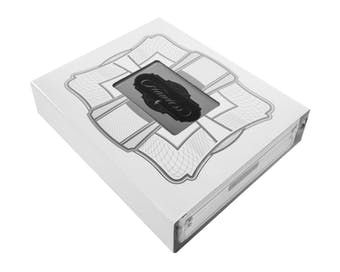 Find one encased base or base parallel diamond card, and one encased autograph card per box! Every card in Flawless is limited to 25 copies or less! All autographs in Flawless are signed on card! Look for Championship Tag Autographs, Logoman Autographs, Dual Patch Autographs, and Jumbo Patch Autographs! BASE SET/BASE SET DOUBLE DIAMOND/BASE SET TRIPLE DIAMOND: All Flawless parallel sets have been upgraded to diamonds! Look for base Single Diamond #'d/25, Double Diamond #'d/10, Triple Diamond #'d/5, and Platinum Diamond #'d/1. Every box contains at least one encased diamond card! STAR SWATCH SIGNATURES: Showcasing only the top players of yesterday and today, Star Swatch Signatures pairs an oversized patch swatch with an on-card autograph! LOGOMAN AUTOGRAPHS: Limited to just one copy each, the logoman is the most coveted piece of the NBA jersey! CHAMPIONSHIP TAG AUTOGRAPHS: Every team with an NBA Championship proudly displays the franchises total titles in a patch on the back of its jersey! GREATS: The resume required to make this set is simple--to be great. Look for a list that includes Shaquille O'Neal, Kareem Abdul-Jabbar, Karl Malone, John Stockton, and more! TRIPLE DOUBLE: In the spirit of the triple-double, find the player, three prime memorabilia swatches, and three diamonds. Look for jumbo diamonds on the Platinum version! DUAL PATCH AUTOGRAPHS: Dual Patch Autographs boasts a checklist ranging from rookies to veterans to retired greats! Newly designed and ready to go, this is a staple of the Flawless brand!